Comfortable and pretty villages straggle into each other in the parishes north of Watton. Ovington is one of them. St John the Evangelist sits on a hill above the main street, some large mock-Georgian houses leading up to it, which you might think grand or vulgar, according to taste. 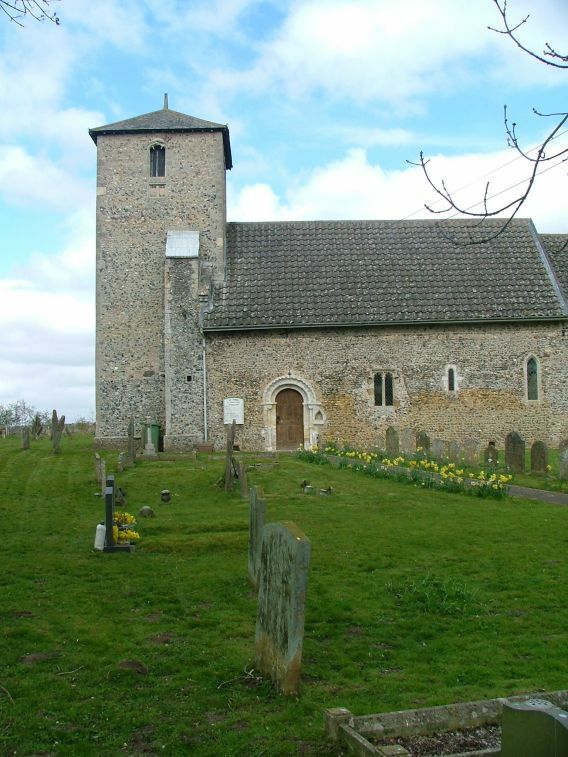 Set behind the village hall is this fine little restored Norman church with a low tower attached, set in a rising graveyard flanked by serried ranks of headstones. On this spring day it was rather lovely. There is no porch, and the Norman doorway, one of the best in this part of Norfolk, is exposed to the elements. It has recently been restored, giving it a look of having been reset here. There is a triangular-headed holy water stoup set into it on the eastern side. The noticeboard to the west of it tells you the dedication, but it is set out in a curious way that might lead you to think that this is The Evangelist Church. There can be no reason for this church to be kept locked other than the sheer effort of opening it up each day, but it is, and you'll find the keyholder's address on the noticeboard. Since we wanted to visit as many churches as possible this day, we decided that Ovington's interior would be one to save for another occasion. The only thing of note inside that Mortlock, Pevsner et al could find to remark on is the unusual 14th century font with a head in each corner, brought here after being removed from Watton. Otherwise, it seems to be an entirely 19th century interior, the east window a fairly run of the mill Crucifixion by Heaton, Butler and Bayne. A pretty lancet glass in the Arts and Crafts manner, which promised better things, is visible across the church from the north side. 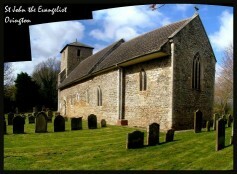 If the inside of the church is kept as well as the churchyard, then it is probably quite lovely. This church is obviously not terribly important, and this village is not notable, or even particularly discernible from those around it. However, it holds a special place in English history. Ovington is one of the so-called Thankful Villages. 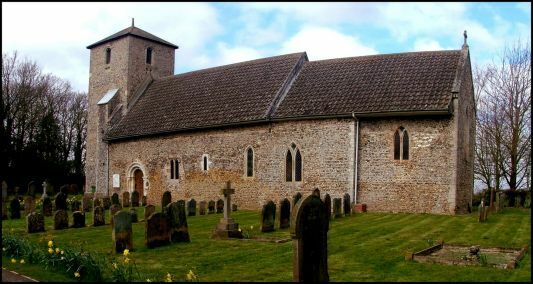 Out of the 20,000 or so English parishes which sent young men off to the slaughter of the First World War, only 31 got them all back again, and Ovington was one of them. Twelve boys out, and twelve boys back. It is the only Thankful Village in Norfolk.